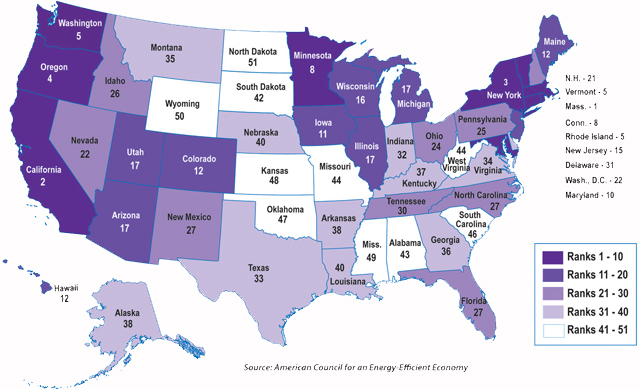 This week, the American Council for an Energy-Efficient Economy (ACEEE) released its annual rankings of the 50 states and District of Columbia on their progress toward adopting and implementing various energy-efficiency policies and programs. This year’s State Energy Efficiency Scorecard reveals that many states are making great advancements in energy efficiency on all fronts – from transportation to industry to buildings, helping Americans save money and creating new business and employment opportunities across the U.S. The biggest advancement is coming from states one might not necessarily associate with strong energy efficiency policy such as Nebraska (up 7 places to #40), Alabama (up 6 places to #43) and Tennessee (up 5 places to #30). Other big climbers this year are Michigan (up 10 places to #17 – tied with IL and AZ); Illinois (up 8 places to #17- tied with MI and AZ); and Maryland (up 6 places to #10), which joined the ranks of the top ten states (MA, CA, NY, OR, VT, WA, MN, RI, CT, MD) for the first time in Scorecard history. This mix of states from different geographic regions and political leanings goes to show that energy efficiency isn’t a Democratic, Republican or Tea Party idea – it’s simply a good idea. But those in the business world know this already. Energy efficiency-related businesses, technologies, products and employment opportunities have skyrocketed over the last several years. We are also seeing a rapid ramp up in utility investments in energy-saving programs and services. Since 2008, electric utility investments in energy efficiency have nearly doubled from $2.6 billion to $4.6 billion in 2010. This $4.6 billion investment resulted in utilities saving their customers more than 13 billion kilowatt hours of electricity and approximately $1.3 billion in electric bills that year. Combined with natural gas programs, total utility investment in energy efficiency was about $5.5 billion in 2010. This rapid ramp up in utility investment in energy efficiency and other state energy efficiency initiatives and policies means good news for American industry, job seekers and consumers. Take, for example, building energy codes. The stronger the state’s codes, the more energy-efficient its building stock will be, and the lower the energy bills will be for building owners and occupants. Not only do strong energy codes save consumers and businesses money, they also create new employment and business opportunities at all levels. Making buildings energy-efficient doesn’t just take construction workers and contractors, but an army of building product designers, technicians, engineers, manufacturers, installers, energy modelers and IT professionals to develop and deliver the energy-saving materials and systems that go into efficient buildings. Materials like insulation, spray foam, LED and CFL lights, light sensors, building controls, high-efficiency motors, furnaces, air conditioners and more - all go into energy-efficient building design and construction. States have made considerable progress adopting better codes. Our Scorecard reveals that 29 states have either adopted or are about to adopt the latest energy saving codes for homes and commercial properties in 2011 – up from 20 states in 2010 and 10 states in 2009. Building codes are just one of 28 policies that ACEEE evaluates when determining states’ ranks. Just think – if all states adopted all 28 policies how much more savings and business and employment opportunities would be created. It’s a scenario I’d like to see become a reality. And if states continue their incredible progress on energy efficiency, it may become a reality sooner than we think.